Bali – tropical rain forests, fields, temples as far as the eye can see, where the Balinese regularly hold traditional ceremonies and present daily sacrifices to the gods to ensure that the spirits and all living creatures and beings living in the country are kept happy and peaceful. In the middle of this incredibly beautiful natural world and spiritual environment, the small town of Ubud is home twice a year to a yoga teacher training course with a difference. Radiantly Alive (http://www.radiantlyalive.com) offers not just a conventional training course in yoga, but combines different styles of yoga, all taught by world-famous instructors, with yoga theory, NLP (Neuro Linguistic Programming) and, what makes it so special, superlative raw food vegan cuisine. Over the period of a four week course, students enjoy gourmet raw food every day so that as future yoga instructors they get to know a whole new dimension to yoga in practice. Boris Lauser, also known as raw food chef and culinary artist b.alive! 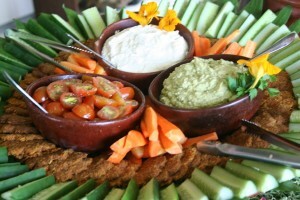 (http://www.balive.org), has been working for Radiantly Alive since May 2009 and enhances the exclusive buffets with his creations. In his role as Assistant Chef, Boris worked together in May 2009 and May/June 2010 with the inspirational chefs Simone Powers (Café Gratitude, San Francisco) and Matt Samuelson (Living Light Culinary Institute, Forg Bragg, California) and gained extensive experience with them. Now, since October 2010, Boris is responsible for running what is a one-of-a-kind programme in this format – the Radiantly Alive Raw Food Chef Apprenticeship Programme. Parallel to training to become a yoga instructor, this 4 week course enables students to train to become a raw food chef at the same time. Assisting in the kitchen every day, where the most delicious and exclusive raw food cuisine is created for up to 70 people at any one time, students learn all the skills needed to prepare raw food, i.e. how to use the various items of equipment, the various techniques used for preparing the food and, naturally, all the raw food ingredients that make for a healthy, balanced, vegan raw food diet. The course teaches students how to prepare balanced menus with well-balanced flavours, which each student is then able to demonstrate on their own day as chef. On that day the student plays chef themselves, being responsible for the planning of the menu, making sure that all the ingredients have been ordered, delegating to staff and assistants and, finally, receiving the words of praise from all the yoga students who are the ones who ultimately have the pleasure of enjoying the masterpiece. But that is just the tip of the iceberg, as there is much more to the programme besides. 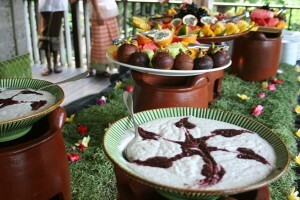 Raw food and raw food nutrition: Raw food course in the tropical paradise of Bali with Boris Lauser: The theory lessons! In theory lessons and selected practical sessions, students learn about vitamins, minerals, enzymes and so much more besides. 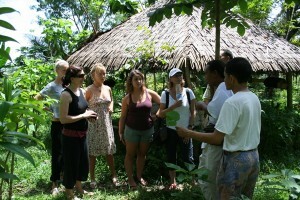 Guest teachers give lectures on ayurveda, NLP and superfoods, and there are also field trips to permaculture centres where students find out about integrated cultivation and local medicinal herbs, along with a full-day tour to a cocoa farm, where the whole process from the fruit through to cacao butter can be experienced live. Bali is a raw food paradise. Coconuts grow here wherever you are and will never be more than 100 m away. Unlike the Thai coconuts with which we are familiar, Balinese coconuts are not hybridised and are therefore still natural, contain less sugar and an incredible amount of water (0.5 – 1 litre per nut!! ), which is full of electrolytes and therefore the perfect isotonic drink in such a hot climate. Boris paid a visit to Gaia Oasis Resort in the beautiful north of Bali to show the local chefs a few basic recipes used in gourmet raw food cuisine, so that they could integrate them in their daily menus. For his Asialive noodles Boris needed young coconuts, as they have slightly thicker meat. The chef simply responded, “No problem”, went out of the kitchen with a long pole and headed into the garden to the nearest coconut tree where he brought down two young coconuts in next-to-no-time. Paradise on earth? Tropical fruit grows all year round. The sweetest mangos, picked when fully ripe, papayas that practically grow in every garden, maracujas, mangosteens, jackfruit, rambutans, pineapples and bananas of all sizes and types make every breakfast a real experience. There are a great many farms in Bali that grow organic fruit and vegetables. Island Organics (http://www.bigtreebali.com/islandorganic.html) is the biggest supplier for every kind of vegetable and virtually every kind of fruit used for catering in the Radiantly Alive Raw Food Apprentice Programme. One of Boris’s own favourite places in Ubud is Sari Organic, a small family-run farm situated in the middle of paddy fields which grows every conceivable kind of vegetable and which also runs a small restaurant where you can enjoy views of the sunset over the paddy fields, maracuja fermented on site – or mango wine – and delicious cuisine created from the produce grown at the farm. For any quick work on his blog, website or b.alive! newsletter between working or after work, Boris likes to use the high-speed Internet in the chic Clear Café on Hanoman Street in Ubud, where he has now managed to try nearly all of the 50 or so delicious drinks and smoothies prepared with fresh fruit, cashew milk and Irish moss. Clear also offers a delicious raw food menu. But what will be of even greater interest to every raw foodist is the fact that Bali is home to a very special kind of wild-growing cocoa and creamy cashew nuts and vanilla beans, the size and aroma of which you will never come across in an organic food store anywhere. The cashew nuts in raw food quality are of an exceptional raw food quality because they are cracked here by hand with a lot of effort. Wild Bali cocoa is certainly something very special as a species because it grows in the wild and, unlike 90% of the rest of the world’s production, is not cultivated on plantations. And it makes you even happier if you can experience it directly, namely fresh from the tree right through to the finished product, namely the raw cocoa bean or the cocoa powder or the butter. 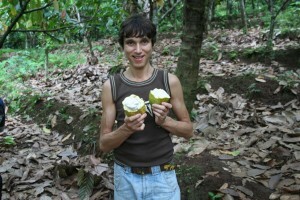 A big highlight of the Radiantly Alive Raw Food Chef Apprentice Programme is a field trip to the Big Tree Farm (http://www.bigtreebali.com), where you can experience the whole cocoa production process up close. 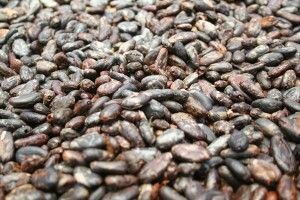 Here you can try the cocoa fruit fresh from the tree, see how the cocoa beans and the flesh from the fruit are fermented and dried and then, in the production facilities, see how the beans are turned into a cocoa paste from which cocoa butter is pressed and the rest turned into cocoa powder. To do this, Big Tree Farms has installed special monitoring systems which ensure that the temperatures involved never rise above the critical level of 42 degrees, something that can quite easily happen, especially in the pressing process. And if you’re feeling really adventurous and truly want to experience every feeling of happiness that cocoa has to offer, then you can even take a dip in the fermented cocoa beans just like Boris here. Bali is truly a little paradise on earth and well worth a visit for every raw foodist, whether it be just for a wonderfully relaxing holiday or to really take a dip into the world of gourmet raw food cuisine and take part in an incomparable programme! What you gain in the one month Radiantly Alive Raw Food Apprenticeship Programme in terms of knowledge and experience is really quite unique. For more information about the programme simply take a look at the Radiantly Alive(http://www.radiantlyalive.com) website or send an E-mail directly to Boris. But if Bali seems too exotic, you don’t have to travel that far to try Boris’s creations or learn about the secrets of vegan gourmet raw food cuisine from him. When he is not in Bali, Boris also offers exclusive gourmet dinners and events in the city he currently calls home, namely Berlin, as well as in other cities around Europe such as Rome or Geneva from time to time. He also gives courses and seminars and is always available to be booked for private coaching, courses and catering as well. For information and contact details: http://www.balive.org.